Mobile tips are rich in quality without the massive limitations of the antiquated SMS Text option. There are no character limitations and photos and videos can quickly be uploaded by the tipster. Admins can now interact in real time with anonymous tipsters with our real-time Live Chat feature. Ping your tipsters on demand with our anonymous push notifications. 70% of all P3 Tips are now submitted via mobile devices, while only 2% of all tips in our former technology were generated by SMS Text Tips. Tips submitted from our mobile app have quickly surpassed all expectations with multiple programs and agencies reporting massive growth in both the number of tips and their inherint quality over old SMS text tips. 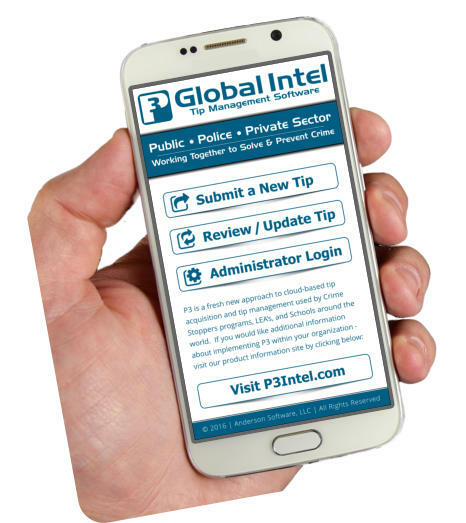 70% of all P3 Tips are now generated by our mobile app. 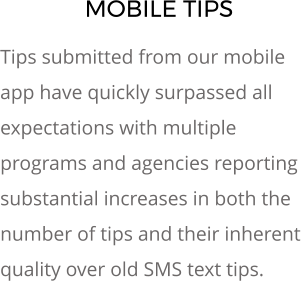 2% of all tips in our former technology were generated by SMS Text Tips.